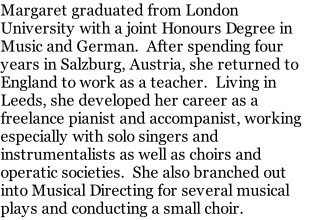 This was followed by 2 years in Holland where she expanded her linguistic abilities, teaching piano and flute in English, German and Dutch, directing a multi-national choir and working with a Dutch clarinettist. Returning to England, eight years ago, she has become established as an accompanist, teacher and choral director in the Chester area. She has performed with many soloists and choirs, and works for Music in Hospitals, as well as teaching privately from beginners to diploma level and working for Music for Life. 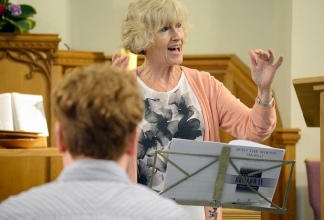 For six years Margaret has worked part-time at Sir John Deane’s College helping music students to develop and rehearse their A-level repertoire, as well as directing the Chamber Choir. She now teaches music at The Queen’s Lower School, where she directs the Junior Choir.